Bakers Pride is a premier wholesale baking company serving the greater metropolitan St. Louis area since 1991. We provide fresh bakery goods for large and small groups including hotels, corporate cafeterias, gourmet coffee shops, catering companies, churches and schools. Our extensive product line emphasizes breakfast items, but also includes cookies and brownies. We are busy baking and delivering fresh products, early in the morning, seven days a week. We have over 200 customers and make over 100 deliveries, on time, each and every day. Our commitment is to provide consistent high-quality products and extraordinary customer service. Please see our FAQs page for more information on our company, products and services. 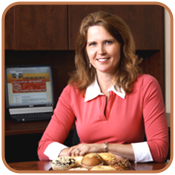 Bakers Pride is a 100% woman-owned commercial food supplier, certified by WBENC.